Since the first laparoscopic nephrectomy was reported in 1991, the urologie community has increasingly accepted laparoscopic approaches for many urologic conditions (9). This acceptance has been fostered by numerous articles demonstrating certain advantages to laparoscopic surgery, particularly decreased postoperative pain and a quicker recovery time to normal activity. In examining whether a new surgical technique is appropriate, one must address the technique's outcomes, morbidities, and costs. Many factors may affect more than one of these criteria, e.g., operative times may affect both morbidity and cost. If outcome, morbidity, and cost results are acceptable, one must then determine whether the new technique is transferable to other surgeons and institutions. While such comparisons of different procedures are often difficult to interpret, certain trends are apparent when one examines open laparoscopy, and hand-assisted laparoscopic renal surgery. For a purely ablative procedure, results demonstrate that laparoscopic and hand-assisted laparoscopic approaches are as efficacious as open surgery. A comparison of open, laparoscopic, and hand-assisted laparoscopic donor nephrectomy showed equally shorter recovery times with laparoscopic and hand-assisted laparoscopic nephrectomy. For a purely ablative procedure, results demonstrate that laparoscopic and handassisted laparoscopic approaches are as efficacious as open surgery. With five-year follow-up, Portis et al. (10) demonstrated equal oncologic effectiveness for open and laparoscopic radical nephrectomy. This had also been similarly demonstrated by Ono et al. (11) in 2001 for renal masses less than 5 cm. Two-year follow-up data for laparoscopic and hand-assisted laparoscopic nephroureterectomy are also encouraging (4,12). Laparoscopic partial nephrectomy can be daunting because of the potential for large blood loss and the need for reconstruction, which can be difficult. However, the laparoscopic procedure has been shown to have good pathologic outcomes (13,14). Numerous studies have demonstrated equivalent graft function for open, laparoscopic, and hand-assisted laparoscopic donor nephrectomy (15,16). A randomized trial of hand-assisted laparoscopic versus open donor nephrectomy clearly demonstrated less analgesic use, shorter hospital stay, and quicker return to normal activity in the hand-assisted laparoscopic group (17). Similarly, shorter hospital stays and quicker returns to normal activity were seen when hand-assisted laparoscopic radical nephrec-tomy is compared to open radical nephrectomy (18). Postoperative complications were similar across all groups in each of these studies. Numerous other studies have similarly shown quicker recoveries for hand-assisted laparoscopic compared to open surgery. The biggest area of controversy is currently whether laparoscopic nephrectomy, particularly with morcellation, offers improved convalescence compared to hand-assisted laparoscopic. Several studies suggest this is not the case. Despite larger tumors in the hand-assisted laparoscopic group, a nonrandomized study by Nelson and Wolf (19) demonstrated equal recovery and morbidity in the handassisted laparoscopic and morcellated laparoscopic groups. A comparison of open, laparoscopic, and hand-assisted laparoscopic donor nephrectomy showed equally shorter recovery times with laparoscopic and hand-assisted laparoscopic nephrectomy (16). During laparoscopic nephrectomy, no differences are seen in postoperative pain or hospital stay whether a specimen is morcellated or removed intact (20). Thus, handassisted laparoscopic and laparoscopic renal surgery appear to be equivalent when examining postoperative recovery. Cost analysis, while important, is a very difficult issue to address. Some studies have demonstrated increased costs associated with laparoscopic procedures due to instrument costs, while other studies have shown decreased costs due to decreased hospital stays (21,22). The issue becomes even more confusing once physician time, patient work hours lost/gained, etc. are entered into the equation. Each element in the process (patient, surgeon, institution, etc.) will have a different cost/benefit ratio that should be considered though absolute values will always be lacking. While hand-assisted laparoscopic and laparoscopic renal surgery show similar benefits, hand-assisted laparoscopic is a more easily mastered technique and can be utilized in situations where laparoscopy alone may not be sufficient. Overcoming the lack of three-dimensional viewing is very difficult for the novice laparoscopist; handassisted laparoscopic allows the surgeon's hand to be in the operative field and can compensate for the two-dimensional view. Open surgeons are not accustomed to operating with the long instruments and fulcrum points needed for laparoscopy; surgeons are comfortable dissecting and retracting with their open hand. 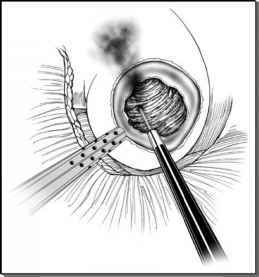 Hand-assisted laparo-scopic can also be helpful for large renal tumors that might not be as easily removed with straight laparoscopy. We have removed tumors up to 22 cm with hand-assisted laparoscopic and feel that nephrectomy under these conditions is more easily performed with hand-assisted laparoscopic than laparoscopy. Together, these factors describe a technique that is more easily learned and can be more widely applied than standard laparoscopy.